I don't really understand why the networks have created TV shows based on the backstory of their most famous heroes, like Batman (Gotham) and now Superman (Krypton), instead of doing shows that actually star heroes like, well, Batman or Superman. 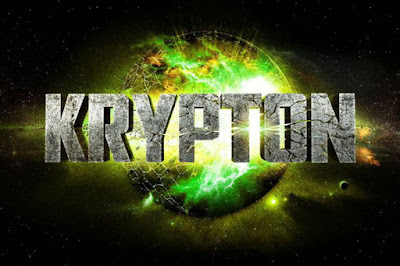 Krypton, which airs on the SyFy channel, looks great, with strong design elements, great set pieces and decent special effects (the city of Kandor is the main effect on display). The actors all do good work, but the accents seem like an odd mix - I'm not sure if that's because of the multinational cast or if they're all just trying to sound different. The story is set about 200 years before our time, as Superman's family - the Els - are being oppressed for standing up to Krypton's Science Council (just as his father, Jor-El, would do just before Krypton's ultimate destruction). The focus is on Seg-El (played by the charismatic Cameron Cuffe) as he struggles with life at the bottom of the pecking order - his family is stripped of its rank and cast into the slums. But his grandfather, Val-El (played by the stately Ian McElhinney), has left behind a treasure of information - and a mysterious stranger appears with a prophecy of doom for Krypton and his grandson, who will become the greatest hero of all. We see the different Guilds that make up the society - Science, Lawmakers, Military- but no one seems to be very good at their job. Seg-El keeps getting in fights with security officers (who shoot at him and chase him, but then seem to turn around and immediately forget his transgressions). Conspiracies surge up left and right, and it's all very murky and dark, with lots of inter-Guild snarking and plots to move up the social ladder. Oh, and a tyrant rules the city with an iron hand. I'm going to give it a few more episodes, but so far it's just OK. I don't mind admitting that I'd much rather see all this money and effort put into a show that actually starred Superman. I was on the same train of I Don't Get It too. I could almost get into it if I put aside it was connected to Superman and that it was just some alien society far away in some galaxy. The approach to it didn't make a lot of sense to me unless that's just the set up to the Superman origin. Remember the days of Adam West and George Reeves when they had one episode and they confront bad guys, fix everything and they still are watched today? That seems like it would tie-in more to recent comics than either Krypton or Gotham.